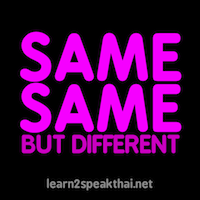 I’m sure you’ve heard Thai people say “same same ” or a popular Germany film called “Same same but different “. When it’s come to Thai grammar and Thai way of like thing are quite not the same. Like, in Thai greeting “wâi” some might think “I know how to wai , you put your hands together” Well, partly true but not that easy. pa-să Thai kláai pa-să Lao. pa-să Thai kláai gàp pa-să Lao. pa-să Thai kláai gan gàp pa-să Lao. pa-să Thai kláai kláai gàp pa-să Lao. Thai language is similar to Lao language. Note: Thai and Lao language are just similar but the same. คล้ายกับ/ kláai gàp+ noun,noun phase. คล้ายกัน/ kláai gan is use at the end of sentence. Thai language and Lao language are similar. Your house is like/similar/as same as my house. All 3 sentences have the same meaning. เหมือนกัน/mĕuan gan is use at the end of sentence. Your house is like my house. Am I answered your question ka? OK, I have to use เหมือน when it is really exactly identical situations or things. And use คล้าย when it just looks like ? more example of คล้าย/ kláai/similar, do you (look) similar you dad or mom ? Normally, children look similar to their parents. This is why I use คล้าย/ kláai/similar since เหมือน/ mĕuan means alike. Use คล้าย/ kláai/similar when it’s just similar, use เหมือน/ mĕuan alike when it’s nearly identical. Now I have to be careful about the pronunciation between คล้าย (high tone) ไกล (middle tone) and ใกล้ (falling tone).